In mid November AAEC Board Member Nita Rearden taught a 3-day dollmaking workshop in Igiugig. Below is her writing and above is a photo of attendee Christina Salmon-Bringhurst with her daughter Erika Yaquelek. Native Arts, such as carving, beading, sewing, weaving, mask making, and doll making are the foundations for traditional culture and learning. One example of artistic activity, doll making, involves making a human form. It requires designing and sewing native garments and expresses traditional gender responsibilities. Mother and daughter working together to make dolls fosters communication, develops language skills, builds family values, and involves sharing ideas and closing the generation gap. It is a mindful activity. In order to accomplish what they are doing requires being in the moment, and avoiding everyday disruptions such as phones and computers. Young native girls are at risk growing up in a village. Doll making and other artistic activities allow young girls to focus and gain valuable traditional knowledge, it also helps young girls to discuss or communicate their needs and communicate with participating mothers, grandmothers, and other adults. The same is true for the boys also, taught from their fathers, grandfathers, and other adults; this learning took place in a qasgiq, or men’s community house. Traditionally, children learned to sew, working with their mothers to make garments for dolls. It is an experiential process involving visual and hands-on activities, with verbal communication. It is the traditional way of learning. Doll making is more than just making a doll, it integrates and practices traditional cultural values, communication, self awareness, and builds creativity and mindfulness. It also involves learning kinship relationships and family and community responsibilities. 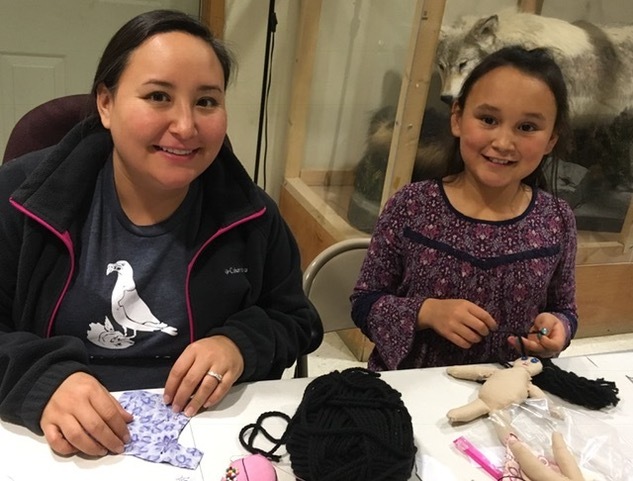 I experienced what is involved in a doll making class with mothers, daughters, and grandmothers in the village of Igiugig on November 14th to the 17th. Igiugig Village Council under a Language Grant sponsored the event. Activity lessons were taught in Yup’ik and the group worked together following the instructions with their daughters and community members. It was a unique experience. I realized that these types of experience do not always happen in all villages. It is something to consider again as it was traditional taught in many homes as we were growing up. Traditional art activities should continue to be taught in the villages in groups and at home, not just in the schools. It has a different effect outside of the school building. Quyana for the wonderful experience, Iguigig Village!